On the right you will find peace and quiet and a family atmosphere, while on the left a private beach for guests of the one and only hotel. You will find mostly rooms to rent and smaller accommodation facilities here. Stegna beach is located just 500 meters along the road from Archangelos, and is the ideal bathing place for the locals. These make up most of the bathers on the beach, along with the visitors. An ideal location for those seeking relaxation. If you want total relaxation, Stegna is the place for you. Friendly people, wonderful food and lovely warm sunshine. We always stay at Georges-Studios apartments which are beautifully clean and well kept but we have several friends who stay at Aroma Studio apartments, which are also beautifully clean & well-kept. There are so many places to eat that we could recommend but most especially Aroma & Maria's for traditional home-cooked Greek food and O Gialos (next to Jack's Bar) for wonderful fresh locally-caught fish. Jack's Bar is a great place to sit and have a drink and just look at the sea. If you want to just chill and take in the view, a visit to Tramonto Cafe Snack bar at the top of the mountain road before you make the descent down to Stegna, is a must. 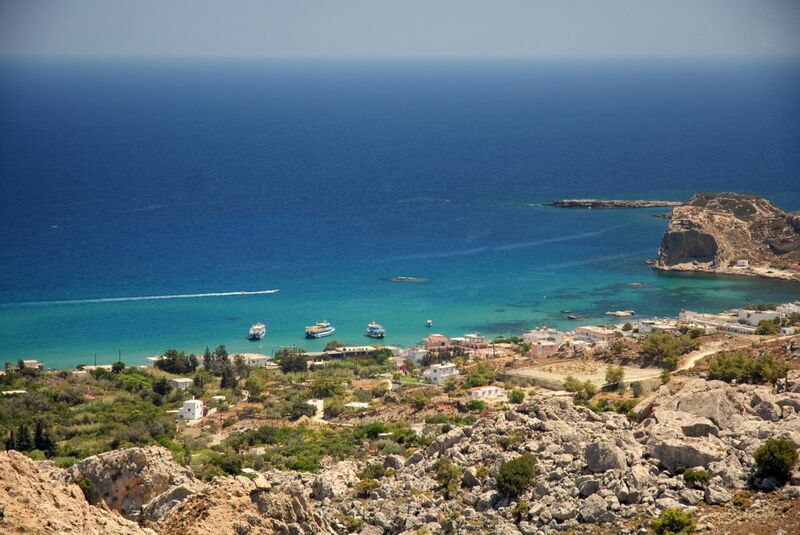 The view of Stegna Bay is absolutely breathtaking and Stefanos, the owner is so warm & friendly. We have only just discovered this place in September 2012 - we just popped in one afternoon on our way back to the apartment, for a much-needed cold drink and ended up staying there for 2 hours just relaxing, watching the goats grazing on the mountain and taking in the view. There is a nice play area for children and it's a great place to just sit and relax. Just visit this wonderful little resort once and I am sure you will be 'hooked' as we were. Also just hire a car for a few days and explore the island. We have been going for 6 years now and discover new things every time we go. It's a fantastic place! We will return there this year and look forward to the wonderful relaxing holiday this resort has to offer. Stayed in Stegna for 2 weeks. I really think 10 days would have been perfect. Very quiet resort, but with the hire of cars and motorbikes, you can see so much more of the island. 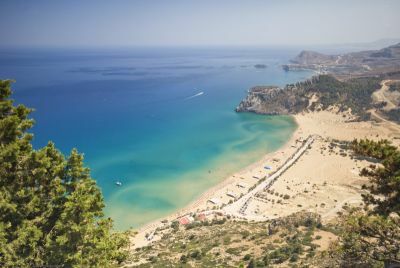 I definitaely suggest Tsampika Beach just up the road and Lindos beach. Nightlife quiet, but send urself down to Jacks bar for music and TV's and make sure u have a pack of cards on you. Catch the bus to Rhodes Town (Charlie will tell u the times), visit the crise ships and old town. Highly recommended if you are after a dead quiet, relaxing, secluded holiday. A week or 10 days would be perfect, I found that 2 weeks dragged a bit. Had a fab holiday in this most gorgeous of unspoilt holiday resorts. Relaxed chilled out vibe during the day and super friendly and fun of a night time. Many thanks to Rich, Chris, Julie, Georgia and the gang for some real fun times at Mercedes Cocktail Bar... it's like a family party every time. Can't wait to come back next year, thanks you guys!!! Say hi to the little fella, Jake I think? hope his broken arm mends ok. Went with my daughter to the Stegna Mare Studios and we had a great time. Felt really relaxed from the moment we got into our room. I've never stayed in such a clean and friendly place - and I've been to many Greek Islands and the Mainland. I will definitely return, just hope that it doesn't become another place on the tourism map, it's so peaceful and quiet! Just got back from a week in Stegna at the Stegna Mare Apartments. Spotlessly clean and Tsambika and George were so friendly. Food is brilliant at the Stegna Star which is right next door and at the Aroma restaurant (they make a fridge cake to die for). Try the Mercedes Bar for great entertainment especially now its under new management with Christos and Peter. 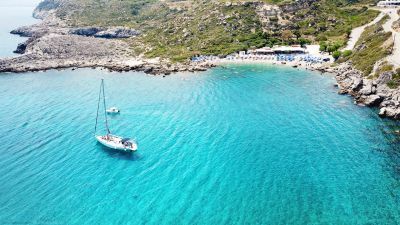 If you want a completely relaxing holiday just sunbathing during the day and dining by night then Stegna is definately the place to go BUT if you want to sightsee around the island then car hire is a MUST. The long and winding road into and out of Stegna takes over an hour to walk and there's only 2 buses a day. We shall definately go back especially for the Rhodes Rock concert which we went to last weekend...A fantastic holiday!!! I spent the most amazing two weeks in Stegna Mare Apts I have ever had total relax, chill place to go and so unspoilt. Tsambika is the most lovely lady you could ever meet and her Husband Charlie loves to chat away to you. In Ten years of travelling around Greece this is the best Apartments spotless clean and have all the equipment you need incl electric kettle!! and a good frying pan which my husband was pleased with. We tried as many resturants as we could and they were all excellent. We have just booked to go back next July and cant wait infact if we could get in we would be going back in October too. This is a must for people who enjoy total relaxing holidays, so very unspoilt shame not more places like this one. Well i'm just back from greece(Rhodes) and I had an amazing time and defo going back. Hopefully next year. Chris George Pete n Georgina were amazing. They keep you entertained until the morning with there normal night and after 12 there own music chris and pete. Love the place so much I will be back. Wow, what a brilliant place, so cool we're going back in September, loved the Mercedes bar, George and Chris's mum during the day offering, briliant food (the bacon feta and onion baguettes are amazing) and lovely hospitality, and on the eving Chris, Niko(yassou captain niko) Georgia and Pete will keep you entertained, well into the morning, listen to their guitar playing, really entertaining, they have live music and karaoke, also a greek and curryoake night, good laugh First time we have hired s car and Rhodes is so easy to drive in, (we hired an automatic a lot easier to drive)snorkelling in Stegna is amazing , everyone is so friendly, we found kozzas to be a fab restaurant, also ate at knights castle, if you like wild nights and pumping music Stegna isnt for you, what you get is genuine hospitality, great company and a fantasic relaxing time with some great people, cant wait to go back roll on September 6 weeks and counting. Just came back, great weather locals so nice to you, Stegna star great food and great staff, merc bar a great place to drink chris and George a1. recomend the boat trip from the harbour value for money, you need a car to get about as a steep hill to climb out of village. see peter at merc bar if you want a memory of your nights at the bar... no cash pionts there so you need to trip out of village. we stayed at contastinos, if you are a family ask for room 14 the best appartment i've had... Chris and George u rock and hope to see you soon! Just got back on Sunday and am looking through the internet for cheap flights, We need to go back to Stegna soon. Maria's cooking, Mercedes fun, Charlie's friendly smiles. All well worth a return visit. The Stegna Mare was fantastic accomodation and Tsampika was the most welcoming beautiful person we have ever met, who made our apartment lovely every day with fresh sheets, towel and flowers to make us feel welcome. She and Charlie know how to make you feel at home. Christos and Georgia make the Mercedes bar feel like a party every night and everyone feels that they are friends instead of customers, Rock on Chris. Lov n kisses to Georgia. We holidayed in Stegna in 2002, during the World Cup, and enjoyed some great matches with English, Italian and even German friends! I'll never forget it, and the rest of the island we toured by car, especially for its peace and friendliness. We ate (quite cheaply) in most of the available places in Stegna and found nothing but good food and a great welcome. An incomparable place! Having been to Mauritius last year guess where we're thinking of this year, which is how I found this site! However, I'm a bit concerned about all this; the beauty is definitely in the unspoiled nature of the place! Please don't tell everybody! Stegna is just a wonderfully relaxing place to holiday. We are about to go back this year in 2006 for the third year running and can't wait. As soon as we arrive at our apartment we just unwind completely - it's that kind of place. We go self-catering because there are some really good places to eat at reasonable prices and we look forward each day to choosing where we are going to eat that evening.Last year we hired a car for a week and did some sightseeing around the local areas near Stegna. This year we intend to go across to the other side of the island and take a look at the mountains. We just cannot wait! Thoroughly recommended for a quiet, relaxing holiday, lovely food and wonderful local people. Just come home from a fantastic holiday in Stegna. People and Place beautiful. A shirley Valentine place!! We are 55 and 70 yrs of age and we went skinny dipping with friends from Mercedes bar at 2.30am in the morning, the sea was so warm we went in twice.. We can't wait to go back, the sooner the better for us. just fell in love with the place. Dora Chris's mum is fantastic. Highly recomended to everyone. Temp. in august was 126 degrees in the morning and rising, that was August. Lindos was great, Rhodes town is not to be missed. The Island tour is a must. Thank you one and all esspecially Chris at the Mercedes Bar..
Stegna is a fantastic little place. Just spent two weeks there that was full of relaxation and great food. We stayed at the Stegna Star, the apartment was spotless and all the staff realy friendly and helpfull. If you want to switch off, chill and get a great tan then this is the place to go even our 13 year old daughter loved it!!! Just returned from our first but not last holiday in Stegna, absolutely loved the reort and the friendly people, espeicially Charlie who looks after the sunbeds and the tourists. Our apartment was overlooking the beautiful beach which never got too crowded, night life was quiet but that was what we wanted, good food in all the tavernas you can try a different one each night, we hired a car for a few days and explored the island which was beautiful but we were glad to get back to Stegna. Came back from Stegna last week! It was just how I imagined. Its just like a village by the sea in England but with beautiful coloured sea, and beautiful people! There was a group of ducks that had there daily swim in the sea 7 of them! Its abit cut of when your down there as its a very steep hill to come out of Stegna but it doesnt seem to matter as there is enough to make you happy there. Went to Rhodes town on a bus from there and Lindos. Its certainly an experience to go up to the Accropolis on the hill by donkey! Went to the Mercedes bar every night Chris and his wife made everyone feel part of his family. Kareoke twice a week. Also can recomend Knight Castle to have a meal and Stegna Star. We liked them all really! Very relaxing holiday! I have been going to Stegna with my family twice a year for the last 5 years and cannot imagine one moment not to go back. Beautiful views, lovely beach and very friendly people. Only hope Stegna will keep this particularity of being saved from invasion of tourists and its unique real local life. The place to visit at least once in your life especially if you are looking for a quiet holiday even though there are anything you need. I strongly advice you to eat at Maria's restaurant next to Mercedes Bar. Maria will cook your greek dishes just how it should be (using products from her own garden) and you would be amazed how competitive the prices are. We had the pleasure of visiting the beautiful resort of Stegna for a week in October 2005. We had a wonderful time in this secluded little paradise. wonderful beach, plenty of good restaurants and tavernas, plus Mercedes Cocktail bar, were we spent many a happy hour sipping cocktails and chatting to the friendly owner, staff and our fellow holiday makers. You couldn't ask for more friendly, hospitable locals and likewise tourists. This has got to be one of the most relaxing holidays we have ever had. This is definetly not the place for those who like to party though, it is a quiet resort with just one bar,(plenty of atmosphere though) and hopefully will remain that way, it would be a real shame to spoil somewhere so magical with comercialisation. 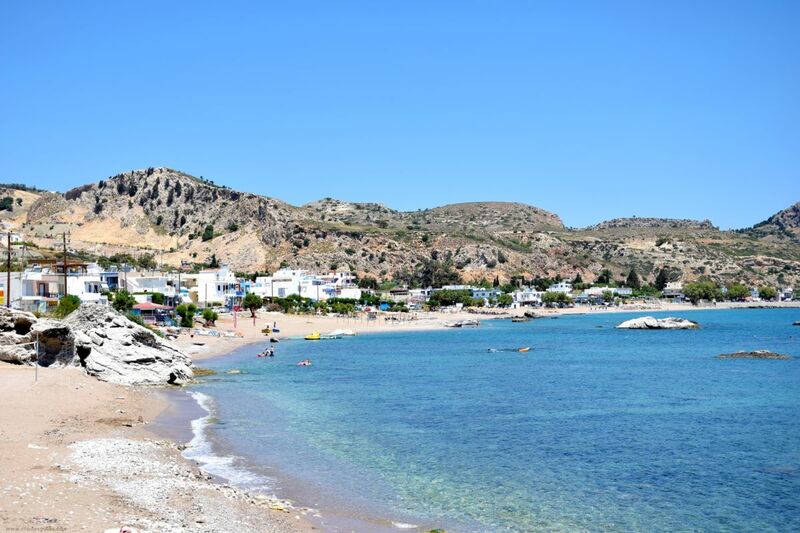 There is a bus running daily from the resort to Rhodes Town (the old town is well worth visiting) and you can pick up another bus running to Lindos from the near by town of Archangelos. Can't wait to return in September this year. We stayed for two weeks in Stegna in 2003 and liked it immensely. The children loved the sandy southern beach (the northern one is more pebbly but quieter) and there were enough tavernas to keep us occupied in the evenings for a fortnight. I would particularly recommend 'En Plo' - in the centre of the village - due to the friendliness of the owners who went out of their way to make us welcome. The make up of the tourists tends to be civilised British families, holidaying Greeks and Germans, who keep to themselves in a compound at the far end of the bay! There are several mini markets and at least two car hire places (next to each other, inevitably!). Stegna is not historic but is attractive and well situated, being not far from the main road and within half an hour of the splendours of Mediaeval Rhodes Town and ancient Lindos. Even in August it was not busy and there is no noisy nightlife. Stegna is utterly wonderful, quiet,friendly, clean, pretty and very isolated, FANTASTIC. Just returned after 2 weeks and will definitely return next year. if you want a quiet holiday for you and your family stegna is the place to go. It has lots of friendly people and you are guarenteed a great holiday. Since I discovered stegna I go nowhere else. It is the perfect place for peace and quiet and hopefully it will stay that way!